Dr. Ehdaie accepts the following list of insurance providers. Select your insurance provider to see more details. 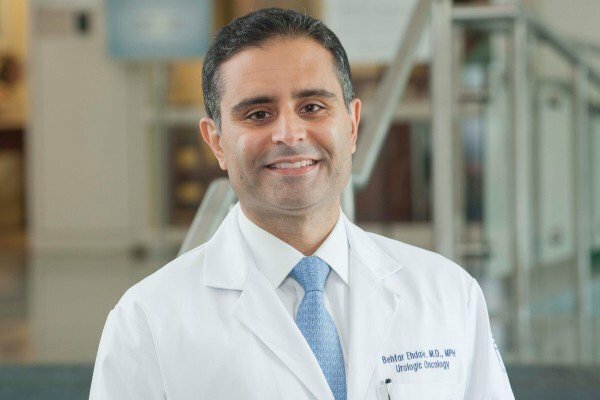 I am a surgeon with special expertise in employing techniques that are minimally invasive for the treatment of urologic cancers, focusing on the novel management of prostate cancer, kidney tumors, and bladder cancer. During my MSK fellowship I received advanced training in focal therapies, which include a variety of noninvasive techniques for destroying small tumors inside the prostate while leaving the gland intact and sparing most of its healthy tissue. I’ve also been involved in pioneering minimally invasive treatments for prostate cancer including robot-assisted procedures. In addition, I have advanced skills in MRI-guided procedures for the diagnosis and treatment of prostate cancer and have performed more than 500 MRI-guided prostate biopsies. I’m also one of only a handful of surgeons experienced in doing extensive lymph node removals at the time of prostate surgery. Committed to achieving cures while preserving quality of life, I am pioneering the development of a novel therapy for prostate cancer for men with less-advanced disease or tumors that are in only one area of the prostate. I’m currently the principal investigator in a clinical trial of a therapy called partial gland ablation that involves using precisely targeted ablative technology to treat only those areas containing prostate cancer cells. Preserving the remaining healthy gland allows physicians to deliver a treatment that is without side effects, such as incontinence or erectile dysfunction. Dedicated to patient-centered care and eliminating the side effects associated with overtreatment of men with low-risk prostate cancer, I support the idea of active surveillance in men with low-risk disease. I am seeking to develop one of the largest surveillance clinics in the world, which includes both advanced imaging and the use of biomarkers to detect cancer progression. I am an international expert in prostate cancer, and have done numerous invited presentations to academic medical centers and professional societies in the United States and around the world. In addition, I am a member of guideline committees that determine optimal prostate cancer management and work to improve prostate cancer biopsy outcomes. I’ve published extensively, with more than 16 peer-reviewed studies. In addition, I serve on the editorial boards or am a reviewer on multiple prestigious journals including European Urology, Frontiers in Genitourinary Oncology, the Annals of Surgical Oncology, Cancer, and the British Journal of Urology International. I am focused on serving my patients and their families and to offering integrated treatment plans tailored to each patient’s needs, concerns, and values. Visit PubMed for a full listing of Dr. Ehdaie’s journal articles. Pubmed is an online index of research papers and other articles from the US National Library of Medicine and the National Institutes of Health.